Yesterday was hot and sunny. A few clouds drifted in the late evening, but the participants of the Summer Science Program could still make observations. 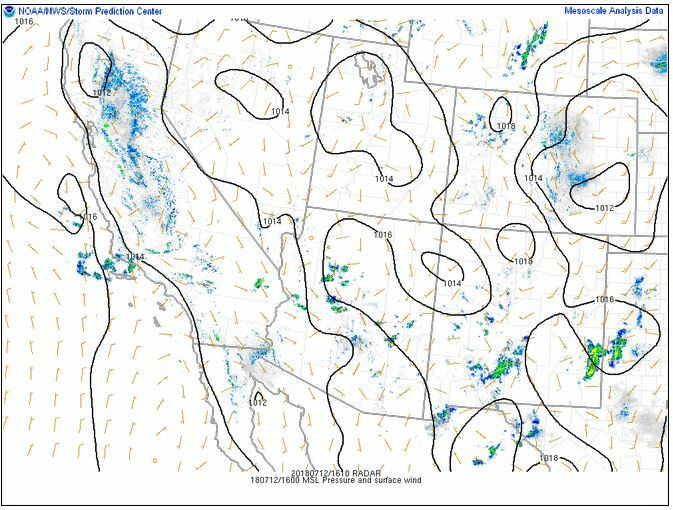 The NWS in Boulder, CO, forecasts increasing clouds, with a 30% chance of scattered showers and thunderstorms, and a high temperature of 93 F. The winds will be from the northeast at 6-9 mph. This evening will be mostly cloudy, with a 20% chance of isolated showers and thunderstorms, and a low temperature of 61 F. The winds will be from the west northwest at 5-9 mph, becoming light and west after midnight. The NWS in Boulder, CO, has issued a Hazardous Weather Outlook concerning scattered showers and thunderstorms in the area. The primary threat will be heavy downpours. 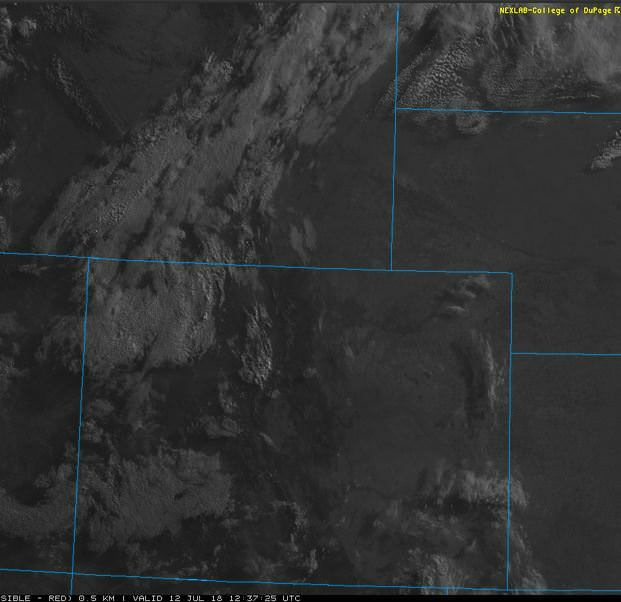 The visible satellite image shows some clouds over the western half of the state today, but very few over the Denver Metro area. 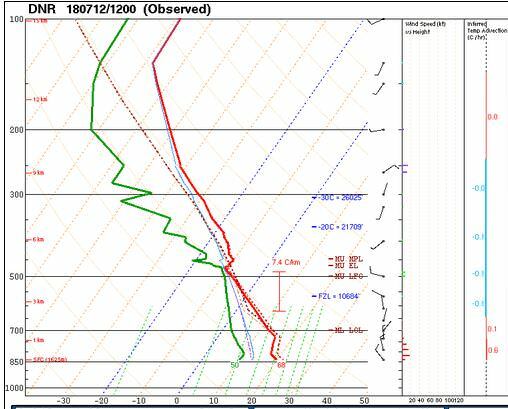 The 12 Z upper air sounding from Boulder shows a nearly saturated layer at 450 mb. There was 0.99 inches of precipitable water present in the column. 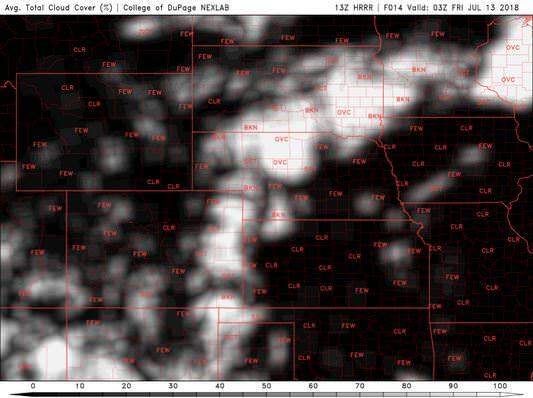 There was 2 J/kg of Convective Available Potential Energy (CAPE) and -400 J/kg of Convective Inhibition (CINH). 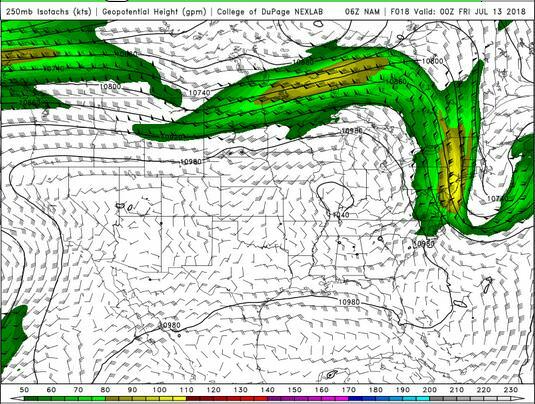 The Lifted Condensation Level (LCL) was 1158 m. There was no thermal inversion near the surface, and the 0-3 km average lapse rate was 6.1 C/km. 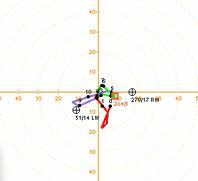 The hodograph shows that there was 4 kts low-level shear (due mostly to directional changes) and 10 kts deep-layer shear (due mostly to speed changes). 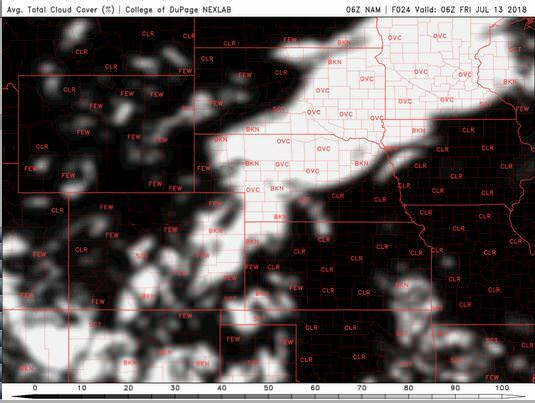 The NAM 250 mb chart shows weak, northerly flow over the state today. 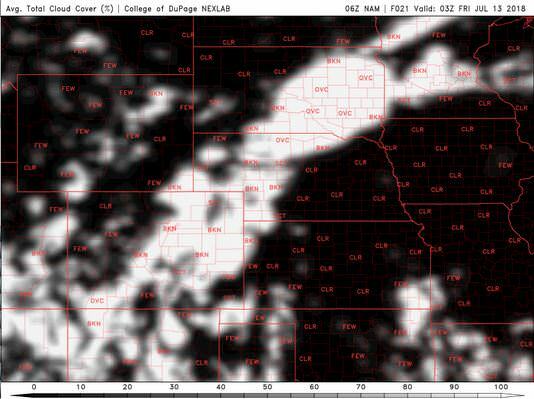 The HRRR simulated reflectivity shows scattered storms firing around 21 Z and continuing into the evening. 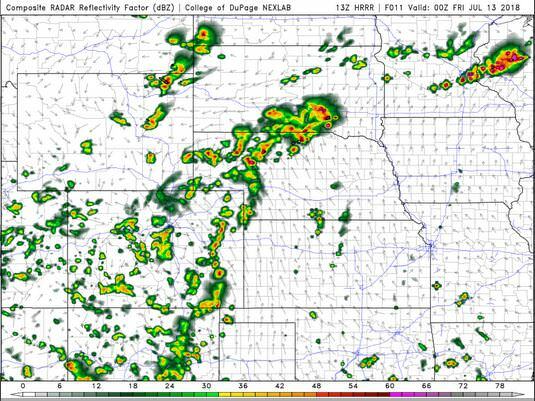 The Denver metro area will be affected by these storms off and on throughout the late afternoon and early evening. 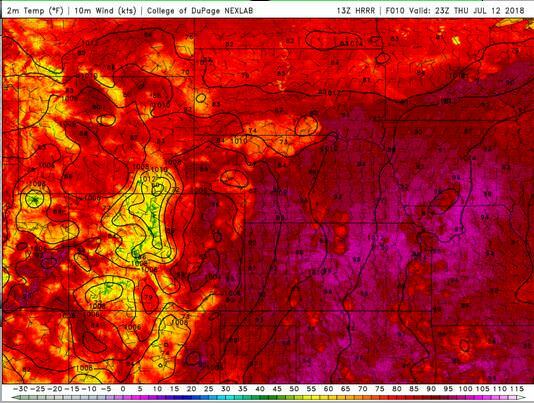 The HRRR predicts that the high temperatures for Boulder will peak in the upper 80’s by 23 Z. 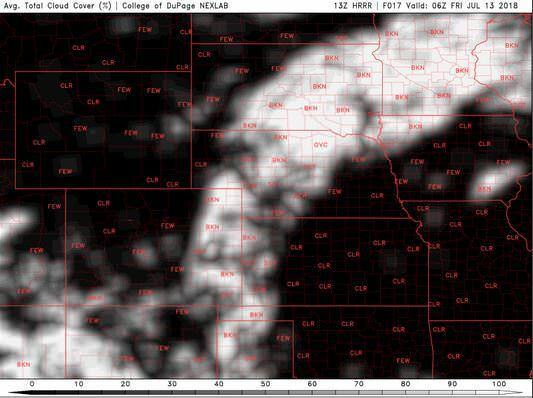 The HRRR dewpoints will hit their peak in the mid 50’s. Today will be a warm, but clouds will begin to form in the early afternoon. Showers and thunderstorms are possible, but in the low shear environment, they are expected to remain below severe limits. The left-over anvil material may block the early shift’s observation’s, but I bet middle and late shift run for sure. This entry was posted in Local WX, Practicing Concepts, Predictions, Satellite Imagery and tagged #cowx, Boulder, colorado, CU Boulder, Denver, forecast, meteorology, weather. Bookmark the permalink.